258 pages | 5 B/W Illus. When we look in detail at the various peripheral groups of disenfranchised people emerging from the aftermath of the Asia–Pacific War the list is startling: Koreans in Japan (migrants or forced labourers), Burakumin, Hibakusha, Okinawans, Asian minorities, comfort women and many others. Many of these groups have been discussed in a large corpus of what we may call ‘disenfranchised literature’, and the research presented in this book intends to add an additional and particularly controversial example to the long list of the voice- and powerless. The presence of members of what is known as the yakeato sedai or the generation of people who experienced the fire-bombings of the Asia–Pacific War is conspicuous in all areas of contemporary Japan. From literature to the visual arts, from music to theatre, from architecture to politics, their influence and in many cases guiding principles is evident everywhere and in many cases forms the keystone of modern Japanese society and culture. 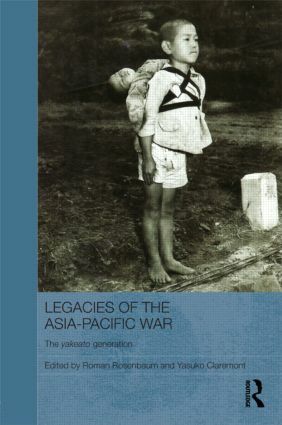 The contributors to this book explore the impact of the yakeato generation - and their literary, creative and cultural and works - on the postwar period by drawing out the importance of the legacy of those people who truly survived the darkest hour of the twentieth century and re-evaluate the ramifications of their experiences in contemporary Japanese society and culture. As such this book will be of huge interest to those studying Japanese history, literature, poetry and cultural studies. Roman Rosenbaum received his Ph.D. in Japanese Literature at the University of Sydney. He specialises in Postwar Japanese Literature and Popular Cultural Studies. In 2008 he received the Inoue Yasushi Award for best refereed journal article on Japanese literature in Australia. In 2010 he will spend a year as a Research Professor at the International Research Center for Japanese Studies (Nichibunken) to complete a monograph on the social activist Oda Makoto. Yasuko Claremont is Senior Lecturer in Japanese Studies in the School of Languages and Cultures at the University of Sydney. She has been teaching modern Japanese literature, comparative literature and Japanese language at all levels. Recent publications include The Novels of Ôe Kenzaburô, 2009, Routledge and ŒModernizing Japanese women through literary journals¹ in Hecate, Vol. 35 1/2 (2009), The University of Queensland Press.